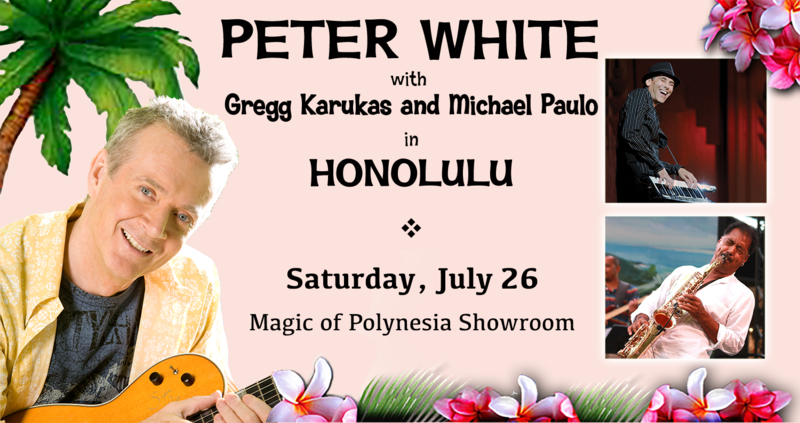 Honolulu will once again “aloha” Peter White on Saturday, July 26, 2014 at the Magic of Polynesia showroom. 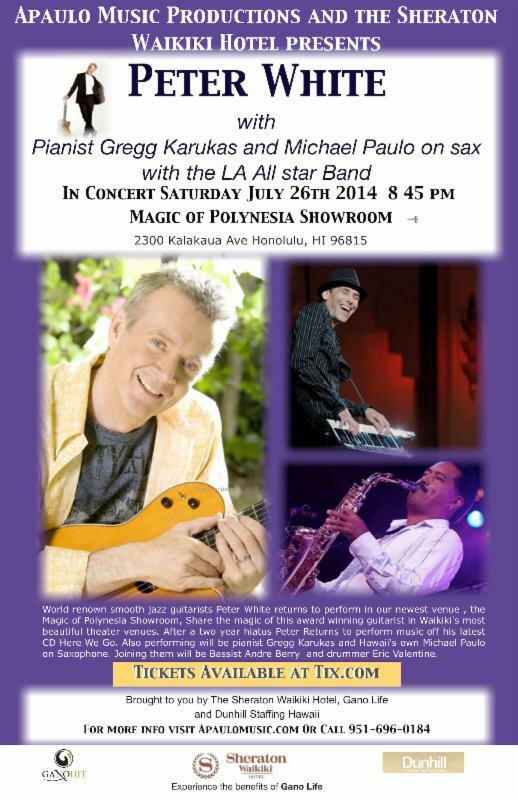 It’s been over 2 years since Peter last performed in Hawaii, and he is thrilled to return with an all-star band from Los Angeles: keyboardist Gregg Karukas, Hawaii native saxophonist Michael Paulo, bassist Andre Berry and drummer Eric Valentine. The newest venue for Apaulo Music Productions, the Magic of Polynesia showroom features tiered seating and state of the art sound and lighting production, and is located on the third floor of the Waikiki Beachcomber Hotel at 2300 Kalakaua Ave.
Group and table discounts available . Please call 951-696-0184 for more info. 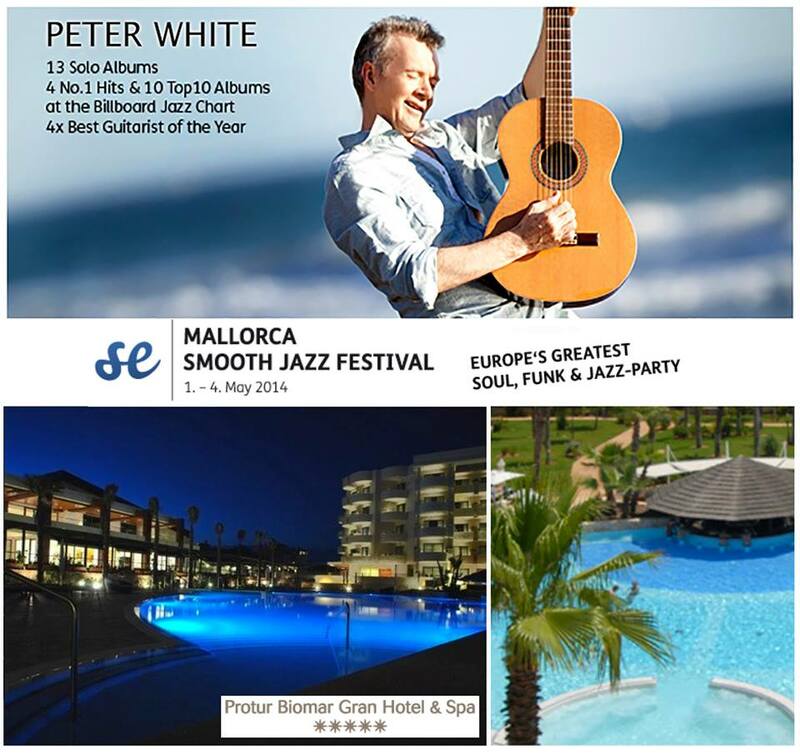 Mallorca and Ghana Smooth Jazz Festivals Welcome Peter White! In the next couple weeks, Peter White will perform in both Mallorca and Ghana! The Mallorca Smooth Jazz Festival is the only smooth jazz festival in the European Mediterranean area. This year, the event is from May 1-4 and will be held at the 5-star Protur Biomar Gran Hotel & Spa. Peter takes the stage on Saturday, May 3. Other artists at the festival include Richard Elliot, Nick Colionne, Jessy J, Gregg Karukas, Elan Trotman, Spencer Day and Paul Shilts Weimar. 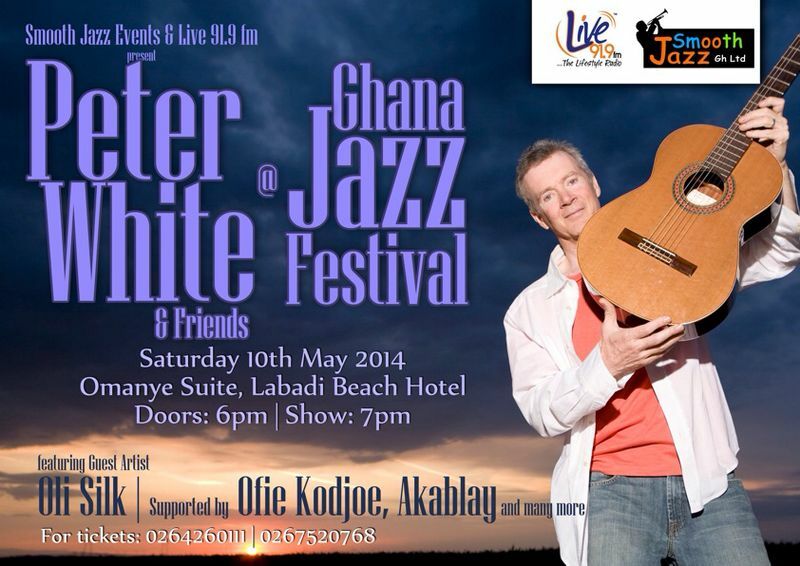 The following week, Peter White returns to Accra, Ghana to play on May 10 at the beautiful Labadi Beach Hotel in Accra, Ghana. The Ghana Smooth Jazz Festival features guest artist Oli Silk and is supported by Ofie Kodjoe, Akablay and many more! Peter White returns to the Philippines. Proceeds to benefit Typhoon Haiyan victims. It’s been 18 years since Peter White’s last visit to the Philippines. 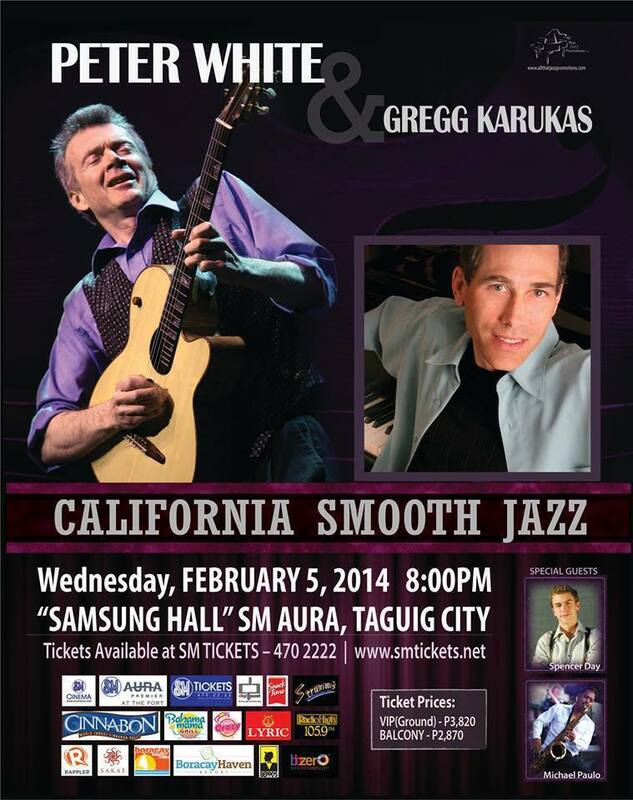 Peter now returns to Manila to perform a show with keyboardist Gregg Karukas on Wednesday, February 5, 2014 at Samsung Hall, SM Aura Premier. The show also includes special guest singer Spencer Day and also features Michael Paulo on sax, Nathaniel Phillips on bass and Eric Valentine on drums. 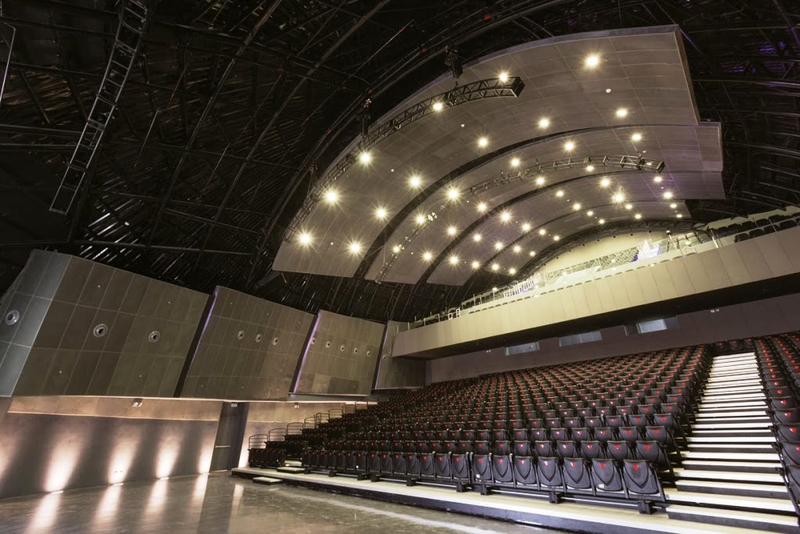 All proceeds of the concert go to benefit the victims of Typhoon Haiyan (Typhoon Yolanda) that devastated the country in November 2013. The goal is to raise as much funds possible to give to All That Jazz Promotions, Inc.’s nominated charity organizations, ABS CBN Foundation “SAGIP KAPAMILYA” and “GAWAD KALINGA” to help in the efforts of providing further medical assistance, and in the rebuilding of homes, schools and hospitals. 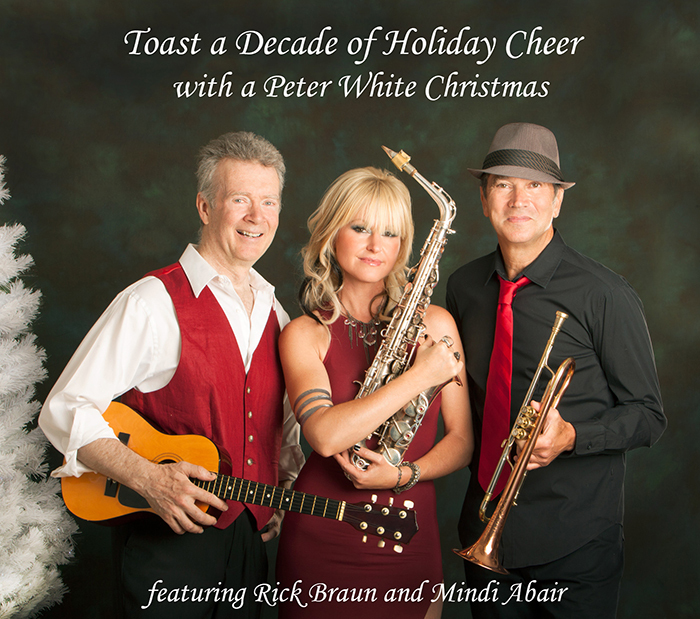 Help us celebrate 10 years of Peter White Christmas shows featuring Rick Braun and Mindi Abair! The always fun, enjoyable trio and their band will be spreading their musical holiday cheer performing 20 dates throughout the U.S. Check out the tour schedule to see if they’re performing in a city near you! Peter White is Heading to Ghana! The National Theatre in Accra, Ghana welcomes Peter White for his first visit to the country! The event takes place on Saturday, October 26, 2013 and will be supported by Queen Asabea Cropper and Kenteman, Bessa Simons, Helen Ma (from the U.S.) and Akablay and the Abisa band. For information and tickets, contact 0264 260 111 / 0274 514 484. Tickets are also available at Joy 99.7FM, Airport Shell, Community 11 Shell Tema and Baatsonaa Total. Al Stewart’s concert at the Royal Albert Hall in London on October 15, 2013 is turning into quite a reunion! 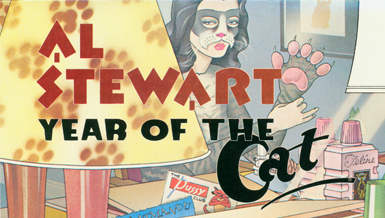 The highlight of the show will be a complete rendering of Stewart’s 1976 release, the Year of the Cat and among those joining Al on stage will be Peter White (piano and acoustic guitar), Tim Renwick (electric guitar), Phil Kenzie (sax) and Stuart Elliot (drums), all of whom played on the original recording. Are you cruising on the upcoming Dave Koz and Friends Cruise this month or The Smooth Jazz Cruise in January? Peter White with be doing a special meet and greet on both. First off, if you’re booked on the upcoming Dave Koz and Friends Cruise, please send an email to pwnews@peterwhite.com with your name, cabin # and number of people attending. 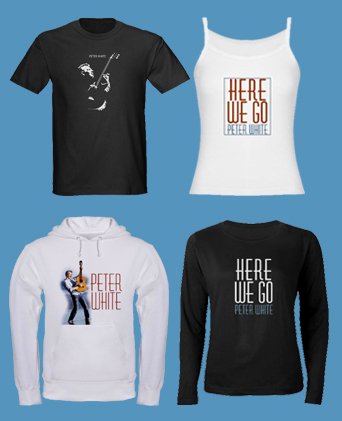 Entrance to the get-together will be to wear one of Peter’s merchandise apparel.